A male 35 y.o. was injured a week ago in a car accident. 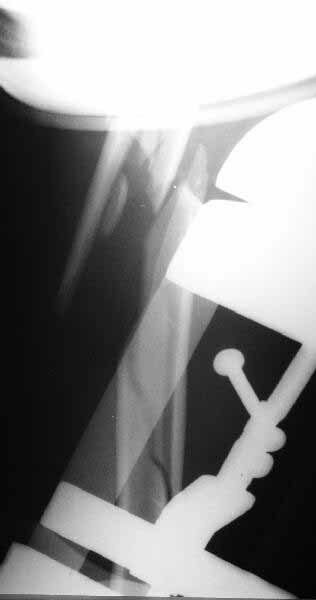 Admitted to us today with an acetabular fracture (ORIF required) and very comminuted open fractures of the humerus. The wound was debrided a week ago at the initial hospital and now looks calm. Image attached (sorry that only one view but another appeared to be almost the same). What would you do with th humerus? That is the worst humerus I have seen. I think I would treat it nonoperative. There is a humerus rod with a blade plate that could be secured into the humeral head. Synthes make it. I have not used it. Is the humeral head involved? If not, I would initially place in coaptation splint, and rex-ray. It may line up, in which case nonoperative treatment can be considered. Other options include locking nail, long bridge plate. IM nail preferred to those, but I am not sure we improve the natural history by operative treatment. Stiffness is expected, and in my experience, related to the original injury more than other factors. It is very difficult to comment meaningfully without knowing whether or not the proximal humerus is involved and to what extent. There must be some sort of radiograph that shows the proximal humerus better. Repair what I think is the Greater Tuberosity Fx, and then use small wire Ex Fix like Ilizarov . Mobile traction and preserve biologic integrity. demonstrate an extra articular fracture with good alignment on the AP, and some displacement on the lateral. This should be able to be managed with adjustment of the traction. Ilizarov is probably the best fixation if you decide to do so. However, it will heal with nonoperative treatment, with painless, reasonable function. Even if it does not heal primarily, the pieces will heal enough to become a single level problem, readily solved with compression plating.